Worldwide Brands Review. Worldwide Brands - does it work in 2012? If you ever tried to find something to sell online you know it is not easy. You got Scammed by fake wholesale companies that appear to be a middle man, you got rejected by BIG snobby companies because you are “SMALL” home based business and you cannot order $100 000 worth with a product. I went through that when was starting my eBay ventures. And here comes Worldwide Brands to help. 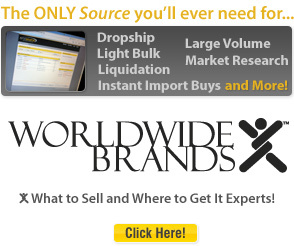 Worldwide Brands is the largest database of Factory Authorized Wholesalers that is willing to deal with “small” businesses and which will sell you small volume quantities of product for additional wholesale discounts. But besides that Worldwide Brands is also a HUGE Product Sourcing Educational center with its own Video Center, Product Sourcing Radio and great selection of FREE eBooks, videos and articles. I see a lot of reviews endorsing different products without author taking time to use, study the product and highlight not only benefits but also possible drawbacks. So let me tell you why Worldwide Brands is not for everybody and may not work for you. If you think the same way as I did than Worldwide Brands is probably not for you. You are not ready yet and need to change your mindset in order to start successful drop shipping business. See, if you are just starting your business and looking forward to selling consumer electronics (as I did) it might be tough because electronics don’t have great margins in retail sector neither on eBay. And you will not be able to buy electronics from well-known brands at really Wholesale price. Large brands as Sony, Nintendo, and Microsoft prefer dealing with large distribution networks as BestBuy, Walmart, and Costco that can purchase millions worth of products. But Worldwide Brands have GIANT selection of suppliers so there is an enormous amount of Other products to sell. And the good news is: there are less competition and higher profit margins. You can have your own store; sell it on eBay or use out-of-the-box storefronts from Yahoo or Amazon. Unfortunately Worldwide Brands was not the first dropshipping directory I subscribed to. I wasted a lot of money on cheap useless lists of “GENUINE” wholesalers. Firstly I was turned-off by the price. Yes Worldwide Brands is more expensive than the most of wholesale dropship directories. But membership is worth every single penny. Database and tools they give you will save enormous amount of time and money in long run. If you are new to online commerce business you will probably want to start with dropshipping model of business, test the product, market and then move on to light bulk and large volume wholesale so you can increase your profits with growth of your business step by step from drop shippers to large volume wholesalers. Is Worldwide Brands any good for selling on eBay? The answer is – YES, BUT you should know a couple things first. A lot of eBay sellers begin their research process backwards, looking first for good product niches, then for suppliers. Yes, you might find out that 16 Gb iPhone is extremely HOT item in Consumer Electronics. So what? If you don’t know where to get iPhone for wholesale/reasonable price you are not going to make any money from it. Don’t put the cart before the horse – locate a product that you can get and sell for a profit. STEP 1. : Find HOT product. Go to Shopping.com Consumer Demand Index (CDI) or Amazon.com bestsellers. These lists make it easy for you to put your finger on the pulse of consumer’s demand, they reveal emerging trends and hidden gems while highlighting the hottest products – these are products that consumers want to buy right now. Browse product categories – you can even drill down to exact models and brands that people are looking for. Your goal is to combine a list of potential high profit products. STEP 2. : Check prices. Two prices determine if the product is right for you. Wholesale price is how much you have to give to supplier. Retail price – how much you can sell it for on eBay. Wholesale price – find suppliers inside WWB directory that carry brands or products that you found in STEP 1. You can search by category, brand or product name. Get their wholesale pricing (You must first contact them in order to set up an account; they will then give you an access to their Confidential Dealer Pricing.) This will give you an idea of how much you can get the product for. Retail price – check prices on eBay ( look for Average Sales price). This will give you an idea of how much you can sell the product for. To simplify the process (so you don’t have to manually check prices for bunch of) auctions you can use free version of TeraPeak (eBay market research tool – see TeraPeak review) scroll to the bottom and click “Sample Report”). Free version will show you up to 14 days of aggregated data. TeraPeak is hands on tool for any eBay seller; it makes market research a piece of cake showing you exactly what to sell and how to sell on eBay. STEP 3. : How much money you can make. Everything boils down to how much money you can make selling a particular product (in our case on eBay) – your profit. You can’t make a profit on. Sometimes brand new sellers are eager to sink their savings into a liquidation lot or a container load of imports. The problem is, they don’t know the first thing about what they’re getting, and they often end up losing their money and giving up on eCommerce all together. The best way to minimize your risk is to start small. You might use eBay drop shipping to test a product without investing any funds in inventory. If it proves successful, you can move up to buying in light bulk quantities for a better price-per-piece. Then, if you find it’s still a strong, consistent seller, you can buy in even greater volume to further increase your profit margins. As you grow, capitalize on the benefits an eBay store. The listing fees are substantially cheaper than with auctions. And you have a place to send the search engines (whereas your auction listings only last ten days, max). Your customers, who came in for one item, can view and purchase many. And you gain the ability to send newsletters, telling buyers what promotions you’re running and which new products you’re carrying. If you are new to drop shipping you need the best education available to maximize your profits. Quality education courses seminars/master-minds can cost thousands of dollars. I personally wasted $2500 on cheesy course and some software that got me nowhere, but Worldwide Brands comes fully packed with best training videos, ebooks and webinars to get you up to full speed to operate your business as a Pro. Education and knowledge is an essential part of running the business; simply having access to wholesale products is not enough – you must know how to operate as a business, or your wholesale access will go to waste. Education course from Worldwide Brand is called the Whole $ale and it includes top-notch materials (videos, books audio courses) from the best in eCommerce business. It used to be sold as a separate course for $199 but now it is included when you buy Worldwide Brands at no extra cost. In fact 2 years ago when I joined Worldwide Brands they did not have all the tools and education materials that are available to members today. They have build relationship with key players in eCommerce business like Amazon, eBay, UPS, Intuit, Yahoo and you can take advantage of this relationship for your business. They have prepared informational videos that will help you automate your shipping information flow, improve communication with your customers and suppliers, allowing you to spend more time on improving your eBiz profitability. Thanks to Worldwide Brands you as a small eBiz owner can tap into traffic flow and exposure of eCommerce giants like Amazon (20 Billion dollars in sales and almost 71 500 000 visitors in 2008) and greatly increase the reach of your eBiz, without spending much time or money to do it! Get special offers from hand-selected, best in the business merchant account providers to process online orders. Delayed, damaged products, returned orders … this can be extremely costly and frustrating for your business. Worldwide Brands shows you how to avoid costly mistakes of poor shipping with their education series “Best Shipping Practices”. I can go on and on about new tools and education resources than you can use to your advantage building successful ecommerce business. Even if you’re not planning to buy Worldwide Brands membership make sure you watch these education videos, you will learn a lot and it will definitely benefit your business. BBB to be sure that you’re buying from a reputable company. Click Here to see Worldwide Brands BBB record. demand, how your current competitors advertise this product, what are the current prices for this product on eBay, how likely this product will bring profits in your pocket. If you are going to try do it yourself it will be MUCH MORE time consuming process. WWB is #1 Because they eliminate a lot of problems and give you tools and education to make your business much more profitable. Value of this investment will grow with growth of your business. 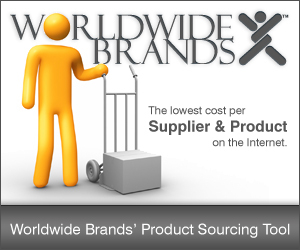 Worldwide Brands is One of a kind complete solution of a Product Sourcing problem. Yes it is more expensive than most of a dropshipping directories but it is LIFE TIME ownership without monthly cost or any hidden fees. And it will save you money in a long run. I have a full membership at Worldwide Brands and never regret my decision. The problem with Worldwide Brands, SMC and places like this is that when you join, you join a market with a million other people doing the same thing with the same products, …you buy into competition. During the market research phase, if you find something that you would like to sell, you then find a never-ending supply of the same item(s) on eBay and/or Amazon from hundreds of other people trying to sell the very same thing from the very same place, …and that makes pricing so competitive, eBay and Amazon are practically the only people making decent money. You begin to wonder if it’s not just a platform where by WWB can make money by buddying up with the big sites then and selling you ‘coaching’ on the side. As you mentioned, name brand stuff that’s sure to sell can’t be aquired thru a place like WWB because it usually requires huge buys-ins, a brick and mortar store front, or other requirements that are out of reach for most starting a home based business. WWB is a good informational resource for people that are starting a home based business from scratch, but even with a huge list of suppliers, niche markets and profits are still hard to come by. I bought a lifetime membership and sometimes I wonder if I would make more money being an affiliate rather than a retailer. Yes, you are right, when you enter the market there always will be competition (and that is good – it is an indication of money in the market ) but there are not millions of people selling the same products. Usually there are 3-5 strong payers in the market that hold most of the market share; the rest ones – are one day -players that come and go. This applies to 99% of niches. You don’t have to have the lowest price in the market in order to make money: eBay and Amazon are not the only two places where you can sell. There are gazillion of independent online stores that are selling same items as eBay and Amazon and they don’t have lower prices but they are still profitable. Look at MyWeddingFavors.com for example – you can find exact same items on Amazon cheaper. In order to win a customer they’re putting unique twist like “free engraving on your Champaign glasses” or “get free… when you buy this…” they are not just selling wedding favors – they are selling “unique wedding favors that reflect your personal style”. People love to feel special and when they feel special they much more likely to buy from you. I think, it is entirely possible that WWB compensated for referring sellers to eBay, Yahoo, Amazon. But at the same time they negotiated a deal with them, so you’re getting value out of it too. I think, referring person to a good product that is working is worth compensation. (There are a lot of folks out there that will try to sell you piece of s##t wrapped in golden foil, just to get commissions). So, giving that most online products have affiliate programs, I figure, it’s better to put the money in pockets of those who’re trying to share the good, than to leave the money to the dishonest affiliates. I think you shouldn’t endorse anything for money that you wouldn’t endorse for free. You may wish to adopt a similar philosophy. We, as online entrepreneurs, should use the best of both worlds so if you’re using a product that is good why not make more money by promoting it as affiliate also? 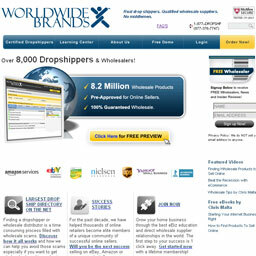 Worldwide Brands is a good eBiz informational resource and their drop ship is top notch. So if you want to promote them, you can check out WWB affiliate program here. Very nice write up you have done here. I too have been searching on tips to make money on the internet and dropshipping might be the answer for me. I would like to know if WWB do provide services for International clients, those that does not reside in Canada or USA? I am worried that if I paid that much money to get in WWB, I can’t even use their service at all. There are many wholesale suppliers inside Worldwide Brands directory that will work with International Retailers (you) but there are couple things you should know about. Majority of the wholesale suppliers they list are in the US. Keep in mind though, that 60-70% of the Suppliers listed will be able to work with you as an International Retailer. As an International Retailer, you would not be required to provide a Tax ID as that is for US residents only. You will still need to provide proof that you are a legitimate business. This means you will have to provide a Registered Business Name to the Suppliers you want to work with check with your local city hall how to become a Registered Business in your location. The reason ALL of the Suppliers cannot work with International Retailers has a lot to do with trade and export agreements that these Suppliers have with their manufacturers, regarding selling outside the US. Doing so could put them into direct and unfair competition with Suppliers of the same products in other countries. In order to sell most effectively to the US market from other countries (or to be able to use ALL of the Suppliers listed in the tool), you would need to either locate and work with a partner who resides in the US, or set yourself up as a US Corporation. 1. A US social security or Tax ID number. 2. A US business address. 3. A US checking account. To obtain these three things, an international merchant must incorporate in the US, as mentioned above. Once incorporated, an international merchant can go to a “Mailboxes Etc.” or other mailbox service in the US and use that as the business address. The Merchant Account provider you choose then ensures that your customers’ money get deposited via wire transfer out to your bank account in your own country. Worldwide Brands has been the tipping point in my business ventures. It’s truly amazing how much time I wasted scouring the Internet looking for honest drop and wholesalers shippers. I used to work for major restaurant chain, I have had decent salary but the hours and pressure was very intense, so I and my wife started our home based business as a side project to get some extra money. When income from our “little” side project started to outpace our paychecks, we took the plunge. It was 4 years ago, now we’re averaging $30 000 a month and keep growing, even when economy is bad, all due to Worldwide Brands. I have been breaking my head for few weeks doing research on if it’s worth pursuing branded consumer electronics and I had narrow down to some credible drop-shippers. As you very rightly mentioned that consumer electronics is a cut throat business, however if by any means lets say I manage to get order of lets say 3000 digital camera’s of a specific make model, would I be able to convince a manufacturer or registered wholesaler to deal directly? hi, i am non-us citzent who is living in USA. I’m wodering that if I could use my partner’s social security and id tax number(in his agreement), and my bank account and then proceed the business without anything about him anymore, just SSN and ID Tax Numbers which I dont have.? I don’t think you can use his SSN and Tax ID when dealing with dropshippers that would be considered identity thief BUT he/she can get all the initial dropshipping paperwork done themselves and then you can sell those items in a store or ebay. Like Luka said below he/she could hire you as an employee. Hi this page has some great information. Are there any requirements to using WWB if you live in Texas? I heard that it requires a Seller’s Permit. I have a Tax I.D. Number. Will that work the same? I’ve never heard of a selelr’s permit. Also, I am very interested in doing reselling online. Is WWB really as good as everyone says and will it surely provide the information and tools I need to have a great online business? In order to work with a wholesale supplier, you do need a State Registered Business Name and Tax ID. It has nothing to do with where you sell; it’s who you BUY FROM. Wholesalers are required by law to keep your Tax ID on file and must have proof that YOU are a legitimate retailer. Worldwide Brands is only as good as you make it, they will surely provide you with education and some tools to get started but it is up to you to use them. WWB have more than enough to get you started with eCommerce but they don’t provide you with a business in a box – it is just education, tools and suppliers. but i did some research on worldwide brands, and someone said that Worldwidebrands have no big brand names and their wholesalers charge a very high wholesale price. If you expect suppliers that drop ship brands like Apple, Sony, Rolex… Worldwide brands don’t have them, that’s true. They have plenty of wholesalers that are less known but carry quality products. Your prices will depend on your purchase volume – the more you buy the better your wholesale price will be. There are wholesale suppliers inside Worldwide Brands directory that will work with international retailers, some of them are US based and some of them are based in Europe. But don’t take my word for it, it is always make sense to check with supplier if they will ship to the country that you need and how much they will charge for it. I am living in UK, UK resident and a registered business. Am I able to purchaase goods from US drop shippers to sell to the US market. I have not yet started my e business and intend to spend time on more research however, it is my understanding that by using WWB i dont have to be dependant upon selling to the market within the country in which I reside UK ? Moving on as a matter of interest I joined WWB in 2007 and never got around to using it fully however let me tell you that when i did my research on two products back in 2007 the two products i wanted to sell according to WWB analytics had an 87 percent and 94 percent prospect of selling well, I was delighted but scared to proceed. Yes, you can sell in US being UK resident as long as you can prove to US wholesale suppliers that you’re registered business name and any other documentation required to prove you are a legitimate retailer. I would suggest double check any product that you come across, their market research tool is not perfect so you have use your own judgment and other tools to make sure that data is not skewed. Terapeak is pretty good in researching profitable markets and good products. I’m from Malaysia. My country is much away from US and UK. Maybe it is find hard to deal business over the US. I wonder if those wholesaler might want to make venture with me. Do you think that US wholesaler want deal with me because of my country far away outside the US? Maybe not much of them are willing to make business, only a few of them will. How about i do dropship by get the item from US wholesaler and sell it back in US market? Do i need find the person US citizen to get the US social security, US business address and US checking account?…i don’t have relatives either buddy living in US to borrow their personal information. I’m from Malaysia and lets say I would like to use WWB, would it work as effective/be profitable for me in my country compared to USA? Speaking of local customers will international suppliers be able to send goods to Malaysia? Just wondring, I think most dropship wholesalers work with ebay, do they also dropship with amazon ? (not the amazon fulfillment program nor their affliate program). or it doesn’t matter ? I just list the product on anywhere I want as long as I obtain a contact with suppliers from WWB ? If you have contract with dropshipper you only supply them with customer contact information and they send the order, it doesn’t really matter how you got the order – through eBay, your own store or Amazon. First of all, I am NOT a dropship customer; I prefer to purchase wholesale for resale, and intended to utilize the directory for new sourcing opportunities. Wow! Was I ever disappointed! The sources I contacted, if they bothered to return a message at all, we’re either purveyors of dollar store junk, or apparently had “special” price lists for WWB contacts, assuming they are neophytes I suppose. With a little searching I discovered other sources selling their best inventory on eBay and Amazon while keeping it off their “wholesale” lists. Others show a great Wholesale price compared to a stated MSRP, but a little research shows that many retailers are selling the products at or near your “wholesale” price. The sources I looked at on WWB were not wholesale sources at all – they were trying to scam new e-retailers. On the plus side though, WWB did not hesitate to refund my money when I asked for it back. There are ways out there to find your own product sources, but these Mega Lists are not the way. It takes work and some investigation on your own. Or better yet, contact some manufacturers directly (I am sourcing from overseas) for your products. When I pay my membership fee with WWB , will I also be charge by the wholesalers to drop ship merchandise, and is there a minimum limit of merchandise that wholesalers are willing to drop ship? You shouldn’t t be charged a fee by legitimate drop shippers, you only have to pay for a product after you collected payment from a customer, there is no minimum limit of merchandise that drop ship suppliers are willing to ship. I’m very interested. Will the supplier willing to ship to Asia country like Singapore ? It depends on a supplier, they have suppliers that ship worldwide. I’m a newbie in this world of ebussiness, It’s very impressive all the information that you have in this blog, very nice! First: I’m not a US citizen but I Have a mail address like “mail box etc”, where I did use to buy from amazon and ebay, do you think that I could work with all the suppliers if they send me the products to my address in US? Second: I have my business and Sales Tax ID from my Country, I will like to sell on ebay, how it work when the product require a warranty? you tell the client send the product directly to the supplier or I need someone in US to pick up the product from the client and the send it back to the supplier? and how it work when the supplier fix or change the product, it will send it back to the client? I am interested in going for the membership. I have been doing physical trading for the last 6 months and I find it profitable, to say the least. WWB seems to be the best path as I want to take my business to a higher level. However, I am in Qatar and I need some partnership to register a business locally which is risky and requires huge amount of money. I just work here but I am from Philippines. Can I register a business in the Philippines and have my market in the middle east and south east asia? Can I also build a website and link the products to the WWB? Have you heard dropshippers.com? Is WWB better than it? Thanks. I really appreciate your knowledge in this. I’m looking for a drop-shipper where I can paste their product links direct to my website and the customer simply clicks on the item and orders the item. Does WWB have that ability or is it simply a directory where I have to find a product and pay for it and do everything manually? Hi, you’re probably looking for affiliate program not a drop-shipper. As an affiliate you can direct people to merchant website where they make purchase and you get a percentage of a sale. Dmitry, you are a great souce for both Retailers and Wholesalers. Thank you so much for sharing your knowledge. I’ve just signed up for Worldwide to list my products. Check out the website when you get some time.